River Valley freshman Sierra Somervile delivers a pitch during the Lady Raiders 8-5 loss to Nelsonville-York on Tuesday night in Bidwell, Ohio. BIDWELL, Ohio — A quick start doesn’t always lead to an ideal finish. 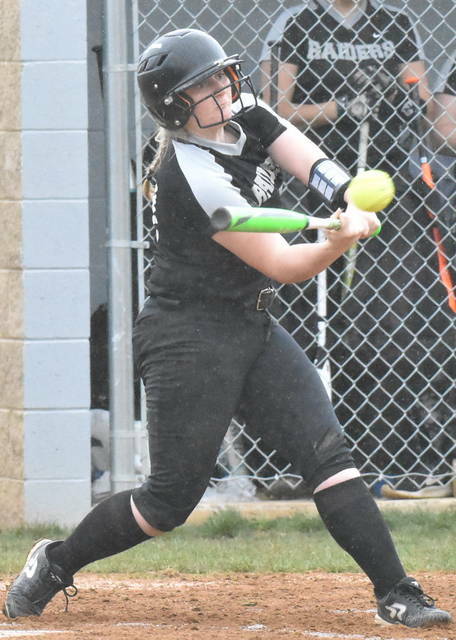 The River Valley softball team jumped out to a 1-0 lead in the bottom of the first inning, but a pair of four-run frames guided the visiting Lady Buckeyes to an 8-5 victory in a Tri-Valley Conference Ohio Division contest on Tuesday night in Gallia County. 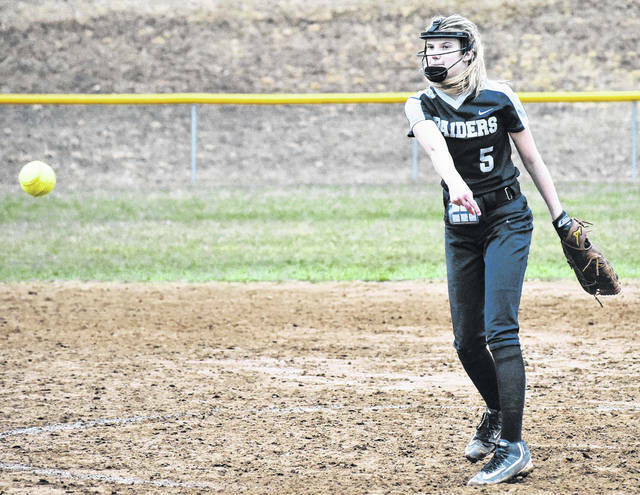 The season opener for RVHS (0-1, 0-1 TVC Ohio) started with a single by Baylee Hollanbaugh, who put the hosts ahead 1-0 when she scored on a two-out RBI single by Airika Barr. Nelsonville-York (1-0, 1-0) countered in the top half of the second with four runs in an inning that saw the visitors send eight hitters to the plate. The Brown and Orange offensive outburst chased starting pitcher Barr from the circle after just one and one-third innings of work. The Silver and Black cut the deficit to 4-3 in the bottom of the third inning as Hollanbaugh and Cierra Roberts each singled with one out and eventually scored as a double by Chloe Gee provided an offensive spark for the hosts. RVHS recaptured the lead in the bottom of the fifth frame, as Hollanbaugh’s third single of the contest started a two-run rally. The Lady Knights sent eight batters to the dish in the inning, as Barr and Kasey Birchfield provided runs batted in to propel the hosts to a 5-4 advantage. The Lady Buckeyes rallied in the top of the sixth, as they plated four runs on four hits in the inning to take a 8-5 lead entering the finale. River Valley mustered just one hit over the span of its final seven at bats, as Nelsonville-York closed out the three run victory. Sierra Somervile suffered the loss as she provided five and two-thirds inning of relief, while surrendering four runs, six hits, two walks and collecting seven strikeouts. At the plate, Hollanbaugh led the Lady Raiders with four hits on the night, while Gee was next with two safeties. Somervile, Roberts and Barr each had one hit apiece, respectively. The guests finished with seven total safeties, as Taylor Shockey led the Lady Buckeyes with two hits, including one double. Addison Bowers, Taylor Ferguson, Sydney McClelland, Skylar Riffle and Caitlyn Hall each had one safeties each.